Adhesion of Vacuum Deposited Films and Coatings. Part 3: Effects of residual stress on adhesion | Management Plus, Inc. 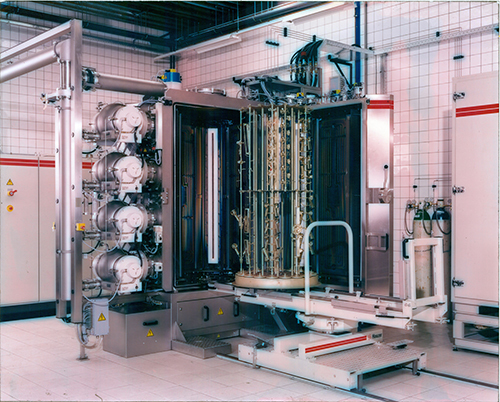 Residual stresses that remain in the vacuum deposited coating after processing may have an important role in the “practical adhesion” of the coating. The stresses may be due to “extrinsic” stresses such as that due to differences in coefficient of expansion of the coating and substrate or “intrinsic” stresses that are “built-in” the film during deposition . Intrinsic stresses may be due to a “strained” lattice where the atoms are further apart than normal (tensile stress) or “compressed” closer than normal spacing (compressive stress) as evidenced by x-ray (XRD). Intrinsic stress may also be due to grain boundary or lattice defect effects. The total of intrinsic and extrinsic stresses in a deposited coating may be evident by deflection of a thin beam (uniaxial stress) or a thin plate such as a silicon wafer (biaxial stress). The deflection may be measured by interferometric methods and calculated using variations of the Stoney Equation . In some cases the total biaxial stresses may be tensile in one direction and compressive in another in the plane of the coating (ex. fig. 11.2 in ). If the practical adhesion is “good” the residual stresses may cause the substrate to deform as shown in Figure 1. If the “practical” adhesion is poor the coating may blister (compressive stress) or fracture (tensile stress) as shown in Figure 1. The residual stress may be high enough to cause spontaneous recrystallization at room temperature . An interesting example of the effects of stress is the early days of satellite technology when the thermally evaporated vacuum deposited pure aluminum conductor stripes would fail with time before the satellite was even launched. After the vacuum deposition the stripes were encapsulated by PECVD at 450oC, which caused grain growth and introduced triaxial stresses in the aluminum stripe on cooling. With time, the stress caused atom mobility and “stress voiding” at interfaces such as the grain boundaries, which caused open circuits. Alloying the aluminum with copper solved the problem, and this necessitated using sputter deposition to deposit the aluminum alloy conductor stripe . 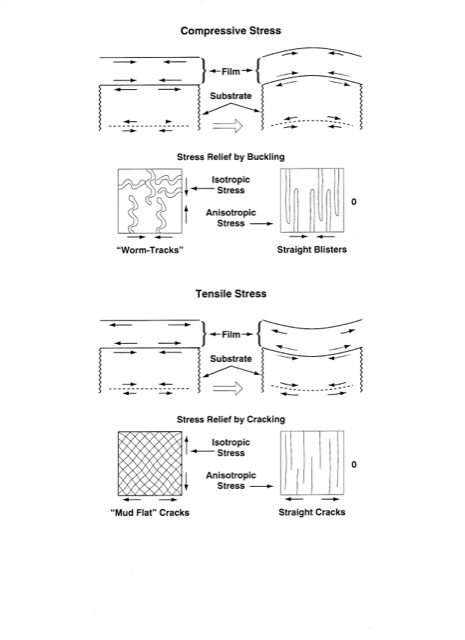 Figure 1: The deformation and fracture patterns in stressed films (fig. 11.1 in ). Residual stress in the vacuum deposited coating may due to factors other than the deposition temperature. In many cases the deposited vacuum coating develops a columnar structure as it get thicker due to ballistic shadowing. These columns are generally microcrystalline and may be poorly bonded to each other so that much of the intrinsic stress is confined to the individual columns and doesn’t contribute to the overall stress in the coating. This morphology (and density) in turn may depend on the angle-of- incidence of the depositing atoms, and “atomic peening” by concurrent (or periodic) bombardment by high-energy ions or high-energy reflected neutrals during deposition. Ions of gases for bombardment are formed in plasma discharges in the ion plating process . Copious “film ions” may be formed in arc vapor deposition and High Power Impulse Magnetron Sputtering (HIPIMS) and may be used for bombardment during deposition . This “atomic peening” introduces compressive stresses in the deposit. High-energy reflected neutrals of the sputtering gas originate from the cathode of the sputtering process at low pressures (< 1.3Pa of Ar). The low pressure allows the high energy neutral to reach the depositing coating with minimal energy-loss collisions in the gas phase. The bombardment energy is dependent on the gas density. This is one reason that the sputtering pressure needs to be controlled with precision and accuracy in order to have reproducible stresses in sputter-deposited coatings from run-to-run. In order to have reproducible coating stress it is necessary to have reproducible deposition parameters such as deposition temperature, angle-of-incidence of the depositing atoms, deposition configuration, sputtering pressure, and concurrent (or periodic) energetic ion bombardment (ion plating). The coating stress may be adjusted by changing the concurrent (or periodic) energetic particle bombardment as is done in ion plating or by adjusting the sputtering pressure as is done in low-pressure sputtering . Coating stress in thicker deposits may be controlled by “layering” the deposit with alternate layers of material under tensile stress and layers under compressive stress  (e.g . “pressure cycling”). Stress may also be affected by the presence of contamination during the initial nucleation and growth (see later blog – “Surface contamination effects on adhesion”). This entry was posted in Adhesion of Films, Uncategorized on February 25, 2019 by admin_29823.